Spring is so joyful to me! Just this morning I was meandering in my yard, breathing deep the aroma of citrus blossoms, checking out the new little green peaches and plums - why, even the blackberry brambles have blossoms today. Busy bees from my hives were excited, too, as they buzzed off to some tree full of blossoms. The gray, cold, and dead days of winter are behind us now, and everything is new. It is a wonderful time of year! When I set out to create the third in this series, I wanted Spring Chapel to capture the wonder of new life. 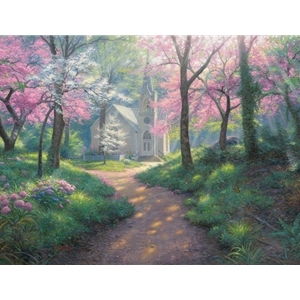 Arranging trees full of blossoms alongside a meandering path which leads you out of the shadows and into the light where this little country chapel is waiting for you to enter; all comes together to give you a sense that you can start all over again. I purposefully added little creatures that symbolize new beginnings and peace along this path, as well, to remind us of this simple truth. This is a new day, a new season, and a time to get some new thoughts about who we are. Life can throw a lot of bad information our way and it is easy to believe many negative thoughts like - "I'm not going to make it through this!" Just when we are about to give up, however, the fresh smell of new life hits our senses and we find hope for a new day. The Truth about you is this: You can adopt a new identity and start all over. Jesus gave up His life through death, so He could unite himself with you in Life and make all things new! By faith, in HIS indwelling LIFE, we can live above the dead things and inhale sweet aromas of his tender love for us each day, and be full of joy for what is to come.